Focusing on workplace accidents that affect the lower extremities, this article determines protective and preventative measures to implement and points to footwear testing procedures. 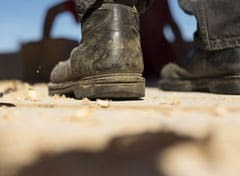 In order to reduce the number of foot injuries caused by workplace accidents, we must first be armed with an understanding of the current situation and then analyse the information obtained in recent years. This article focuses on the analysis of the labour accidents involving sick leave and how these injuries affect the feet and legs, and determines the protective and preventative measures that should be considered. Legislation on the prevention of occupational risks establishes that Personal Protective Equipment (PPE) should be used only as the last line of defence to protect the body against workplace accidents. However, if all other preventive measures fail to reduce the risk level, PPE becomes the only remaining barrier to protect the user. While this situation is never desirable, if an accident takes place, only a correctly selected and used PPE will provide an adequate protection. Graph 1 shows the total number of occupational accidents and their incidence rate in Spain. Data collected in 2013 by the Ministry of Employment and Social Security show that the number of workplace injuries resulting in sick leave has decreased by one percent, going from 408,537 in 2012 to 404,284 in 2013. Is the equipment being used? Was its selection appropriate to the potential risks? Does it meet the required standards? Graph 2 shows the percentage of accidents that occurred in 2013, classified according to the part of the body injured. It is noteworthy that these data have not significantly changed in recent years. From Graph 2 we can conclude that 29% of all injuries in 2013 affected the lower extremities: hips, legs, knees, ankles, feet and toes. In these cases, PPE such as safety footwear, kneepads and aprons could have acted as barriers against hazards. Protective footwear should not neglect the toes and ankles. It should be designed to protect the feet from falling items, corrosive chemicals, sharp objects and extreme temperatures, as well as wet, uneven and slippery surfaces. Working conditions are usually dangerous for workers and the lower extremities are, as previously highlighted in this article, one of the areas of the body most susceptible to be damaged. With this in mind, it is important to note that safety footwear offers suitable protection to prevent harm coming to workers. There is an additional regulation, UNE-EN ISO 20346 ‘Protective Footwear’, but this is rarely demanded by companies when certifying products, as it includes toe protection to a lesser extent than UNE-EN ISO 20345. It requires an impact resistance test, applying an impact energy of 100J, and a compression resistance test with a load of 10kN. UNE-EN ISO 20344 standard is chosen as the model regulation so it includes all the test methods for all kinds of footwear, not just safety footwear. The ISO 20345:2011 standard includes the compulsory requirements of impact and compression resistance for toe protection in Class I and II footwear. All these regulations distinguish between Class I and Class II footwear. Class I footwear is made of leather and other materials, excluding all-rubber and all-polymeric footwear, whereas Class II is all-rubber (vulcanised) and all-polymeric footwear (moulding). The following sections detail the procedures and methods for testing foot protection, including impact, compression and penetration resistances. Impact resistance is one of the main tests for safety footwear to ensure its design will protect the toes from strikes. After footwear is tested in accordance with the method described in the section 5.4 of ISO 20344:2011 standard, with an impact energy of 200±4 J, it is compulsory to check the requirements relating to clearance under the toecap (Table 1). It’s important that the toecap shows no signs of cracks along the test axis that pierces the material. Compression resistance is designed to verify the toe protection against compression hazards. After footwear is tested in accordance with the method described in the ISO 20344:2011 standard (section 5.5), with a load of 15±0.1kN, the level of clearance under the toecap must be inside the limits shown in Table 1. An additional requirement of safety footwear is that it must offer protect against objects that could penetrate through the shoe or boot and ultimately into a worker’s foot. The penetration resistance test determines the minimum value of the penetration force for a nail piercing a sole. This limit is 1,100N. From sample preparation to test procedures, the following sections look at how impact, compression and puncture resistance are determined. To prepare the sample the testing axis must first be located. This is done by placing the footwear on a horizontal surface and against a vertical plane so that, as shown in Figure 1, it touches the edge of the sole at points A and B on the inner side of the footwear. Two further vertical planes must be constructed at right angles to the first vertical plane so that they meet the sole at points X and Y, the toe point and heel point, respectively. Then, a line is drawn connecting X and Y. This constitutes the test axis for the forepart of the footwear. The forepart of the footwear is prepared by cutting off the toe end 30mm behind the rear edge of the toecap. The complete upper assembly flush with the rear edge of the toecap is removed, without removing the upper and lining in the toecap area. If the footwear has been supplied with a removable inner sock, the test must be carried out with it in place. When it comes to the testing procedure for impact resistance, the modelling clay cylinder should be placed on one of its bases inside the specimen, as shown in Figure 2. To test footwear up to and including size 40 the cylinder should have a diameter of 25mm ± 2mm and a height of height 20mm ± 2mm. For footwear above size 40 the cylinder’s height should be 25mm ± 2mm. The test piece is located in the impact apparatus so that when the striker hits it, the striker will project over the back and the front of the toecap. The clamping system must be adjusted accordingly. The striker is allowed to drop onto the test axis from the appropriate height to give an impact energy of (200±4) joules for safety footwear. With the measuring device, a measurement of the lowest height to which the cylinder has compressed is made, to the nearest 0.5 mm. This value indicates the clearance at the moment of impact. To test the axle, the sample preparation is similar to that described in the previous method; moulded dough cylinders are equally similar. The procedure for determining compression resistance is as follows. As shown in Figure 3, a cylinder is located on one of its ends inside the test piece. Then, the clamping system and test piece are located between the plates of the compression machine and compression of the test piece is carried out until the load of 15±0.1kN for safety footwear has been reached. Penetration resistance must be determined for soles with both metallic and non-metallic anti-penetration inserts. To prepare a sample with a metallic insert for penetration resistance, remove the upper from the bottom of the footwear and use the bottom as the test piece. The test equipment used is capable of measuring a compressive force up to at least 2,000N. It is fitted with a pressure plate in which a test nail is fixed, and the sole unit of the test piece sits on a parallel base plate with a circular opening of diameter 25mm. The axes of this opening and the test nail must be lined up. The test procedure for penetration resistance test of a metallic insert is as follows. The test piece is placed on the base plate in such a way that the steel nail can penetrate through it to the opening in the base plate. The nail is pressed againstthe sole unit at a speed of (10±3) mm/min until the point has penetrated completely and then measure the maximum force. The test is carried out at four different points on the sole unit, at least one in the heel region, with a minimum distance of 30mm between any two penetration points and a minimum distance of 10mm from the edge of the insole. For cleated soles, the test is carried out between cleats. Two of the four measurements must be made at a distance of 10mm to 15mm from the line represented by the featheredge of the last. The minimum value of the individual measurements is reported as the penetration test result. To determine the penetration resistance of footwear using a non-metallic anti-penetration insert, the piece, equipment used, punch and test points are the same as detailed previously for penetration resistance in footwear with a metallic insert. The test piece is placed on the plate in such a way that the steel nail can penetrate all the way through. The nail is pressed against the sole unit at a speed of (10±3)mm/min up to the required force of 1,100N. The machine is stopped and either a visual inspection within 10 seconds at an angle of (90+-15)º to the nail axis, or an electrical or cinematographic detection, is carried out. To sum up, compliance with these requirements will undoubtedly help to mitigate injuries as well as keeping all other properties necessary for safety shoes.